Sunnyvale, CA, July 18, 2014 – Vitria Technology, Inc., a leading provider of streaming analytics and business process management solutions, today announced it was featured in The Forrester Wave™: Big Data Streaming Analytics Platforms, Q3 2014 from Forrester Research, Inc.
Vitria provides the industry’s leading streaming analytics platform that delivers continuous operational intelligence. 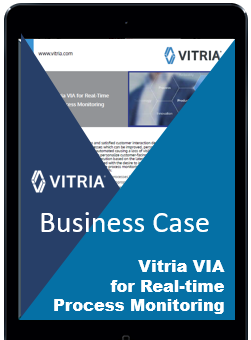 Enterprises have deployed Vitria Operational Intelligence (OI) to help them uncover, analyze and act on insights from streaming data – in seconds and minutes. With Vitria OI, they can continuously monitor their network and infrastructure, improve their customers’ experience in real-time, engage in more targeted one-to-one marketing to increase loyalty and reduce churn, proactively detect and prevent cyber security attacks and fraud, monetize M2M and Internet of Things (IoT) initiatives, and more.